What has China done up to now? African swine fever (ASF), caused by African swine fever virus, is a hemorrhagic and often fatal disease of domestic pigs and wild boar, which is notifiable to the World Organization for Animal Health. On August 3, 2018, China reported the first outbreak of ASF in Shenyang, a northeastern city of China. As of October 8, a total of 33 ASF outbreaks were reported in eight provinces in China, the biggest pork producer and consumer in the world. This commentary summarizes the current situation of ASF in China, measures that China has taken to control the disease, lessons learnt from other countries, challenges and recommendations on ASF control in China, and possible international collaborations on ASF. ASF is an unprecedented disaster and challenge to the Chinese swine industry. It will be a formidable and protracted campaign to control ASF in China, which requires joint participation and coordination of stakeholders and agencies at different levels. On August 3, 2018, China reported an outbreak of African swine fever (ASF) in Shenyang, a northeastern city of China . This is the first emergence of ASF in China, which is the largest pork producer and consumer in the world. As of October 8, a total of 33 ASF outbreaks have been reported in eight provinces in the country (Fig. 1; Table 1). Though the ASF viral sequence in China is highly homologous to that of the Georgia 2007/1 strain , it remains a mystery where and how the virus came from . It is speculated that the disease might have been introduced from an ASF-affected Eastern European country via smuggled pork or offals. ASF is a hemorrhagic and often fatal disease of domestic pigs and European wild boar, and is notifiable to the World Organization for Animal Health (OIE). The disease is caused by African swine fever virus (ASFV), which is the sole member of the genus Asfivirus within the family Asfaviridae. ASFV is a tick-borne large DNA virus with complex transmission cycles among pigs, wild boar and soft ticks, and encodes more than 150 viral proteins with half of unknown functions. The virus shows high genetic and antigenic diversity. Up to now, 24 genotypes and 8 serogroups have been identified globally [4, 5]. The Ministry of Agriculture and Rural Affairs (MARA) of China has issued a number of policies and regulations for the prevention and control of ASF before and after ASF outbreaks in China (Table 2). Following confirmation of ASF outbreaks in China, standard measures have been implemented to control the disease, including culling all the pigs within 3 km of the epidemic area, harmlessly destroying all the infected pigs and animal disposals and contaminants. Till now, around 50 000 infected and affected pigs in the 33 ASF outbreaks in China have been culled (data from OIE), and the infected farms and contaminated materials were cleaned and disinfected. Following confirmation of the first ASF outbreak in China, the MARA immediately reported this event to the OIE on the same day and launched the ASF Contingency Plan and Emergency Response Level II. A series of regulations and actions have been taken by the MARA, including pig movement restriction inside the country, surveillance outside containment and/or protection zones, screening, quarantine, official destruction of pig products, official disposal of carcasses, by-products and wastes, stamping out, control of wildlife reservoirs, zoning, and disinfection, etc. To stop using pig’s blood products as raw materials to produce pig feed. To prohibit importing pigs, wild boar and related products directly or indirectly from Hungary. China has the largest swine population in the world, with 688.61 million pigs fattened in 2017, accounting for approximately 48% of the world’s pork production (Source: Livestock and Poultry: World Markets and Trade, United States Department of Agriculture, April 2018). Meanwhile, small-scale and backyard farms with low biosecurity produce more than 60% pigs in China. A well-recognized high risk is swill-feeding currently practiced in many countries including China, which is a frequent route of ASFV introduction into ASF-free countries, e.g. Spain, The Netherlands, Belgium, Cuba, and Georgia . A total of 20 ASF outbreaks occurred in farms mainly practicing swill-feeding in Anhui and Liaoning provinces of China. And illegal movement and slaughter of sick pigs before diagnosis pose another risk. 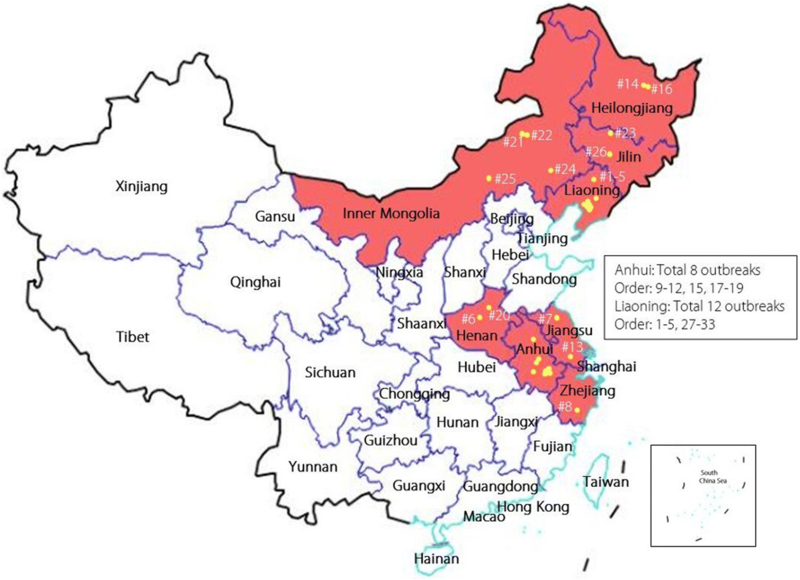 The uneven distribution of the pig production in China makes long-distance pigs/pork transportation unavoidable, resulting in a higher risk of spreading ASF. Moreover, due to the endemic or epidemic situation of ASF in the Russian Federation and other countries, the disease has a high possibility to be reintroduced into China. Another challenge is wild boar and soft ticks, which are natural hosts of ASFV and are widely distributed in China. We need to know if ASFV has taken root in wild boar and ticks after continuous outbreaks. Though various vaccines against ASF are under development, none is commercially available. Difficulties in vaccine development need to be overcome, including safety concerns, poor cross-protection, and the lack of markers for sero-surveillance. China can learn a lot of lessons from other countries with a history of ASF. Take Spain as an example. ASF was introduced into Spain in 1967 and was not well controlled until 1985 when the European Union provided sufficient financial support to eradicate the disease. Spain established a network of mobile veterinary team and a reference laboratory for ASF surveillance and outbreak identification. Animal movement was under strict control and illegal pork transportation was forbidden. Reasonable compensation was provided for culling pigs . Russia is another mirror for China. ASF has spread widely and become an endemic disease in Russia since the first introduction in 2007. The main reasons are: (1) illegal movement of infected pigs and pork products, swill-feeding, and improperly handling infected pigs; (2) circulation of ASFV in wild boar and anthropogenic factors; (3) lack of effective prevention and control measures and nationally funded eradication program; (4) absence of veterinary oversight for the large number of small holdings and backyard pig farms with low biosecurity [8, 9]. ASF is mainly transmitted by direct contact with infected pigs or ingestion of ASFV-contaminated pork products, etc. ASFV infection can also take place when the susceptible animals get physically in contact with ASFV. At present, no effective vaccines are commercially available and its control mainly relies on early detection and rapid eradication . All the responsible stakeholders, including backyard farms, pig transporters, slaughter houses, veterinary services and authorities should join together to successfully implement the ASF control strategies. Effective measures must be adopted to control the disease. Owners of pig farms obligatorily to report any suspicious cases, ill or dead pigs to local veterinary authorities. Kill soft ticks, flies, and mosquitos. ASF is a formidable transboundary disease. Since the ever-increasing personnel exchange and globalization, ASF has a high risk to be introduced into any ASF-free countries, especially Asian countries. Therefore, the battle against ASF needs the international participation. A safe and effective vaccine is a priority for the cost-effective control of ASF in countries with a large swine population. Joint efforts on vaccine development should be made among international laboratories, including identification of virulence- and protection-associated proteins, generation and comprehensive evaluation of gene-deleted vaccine candidates with complete as well as cross-genotype protection, serological markers and no side-effects, and development of immunological parameters and assays for vaccine evaluation, etc. Other activities include transboundary and inter-regional surveillance of ASF, information sharing, and training of young scientists, especially epidemiologists. ASF is a highly devastating swine disease. Undoubtedly, the emergence and spread of ASF in China, the largest pork producer in the world, is an unprecedented disaster. To control ASF in China, where there are a large number of small holders and frequent pig/pork transportation, is a challenging and long-lasting battle that needs the joint participation and coordination of all stakeholders nationally and internationally. We thank Dr. Lihong Liu, National Veterinary Institute (SVA), Uppsala, Sweden, and Drs. Teshale Teklue and Yuzi Luo for revision of the manuscript. This work was supported by the National Key Research and Development Program of China (No. 2017YFD0500601). Tao Wang and Yuan Sun wrote the manuscript. Hua-Ji Qiu conceived and revised the manuscript. All authors read and approved the final manuscript. Zhou X, Li N, Luo Y, Liu Y, Miao F, Chen T, et al. Emergence of African swine fever in China, 2018. Transbound Emerg Dis. 2018. https://doi.org/10.1111/tbed.12989.